This guide is written to be as simple as possible to follow. I have written many posts on how to do this in the past and I generally will use AviSynth AVS scripting which is still my favorite way of doing a PAL DVD to NTSC DVD conversion but if you use TMPGEnc Plus 2.5x as your MPEG-2 DVD encoder you can get away without using AviSynth and so in order to make the process as simple and easy-to-understand as possible we will be using just TMPGEnc Plus 2.5x in this guide and no AviSynth at all. I will be using the UK Region 2 PAL DVD release of PHANTASM IV - OBLIVION as my source example in this guide. First thing we want to do is RIP the DVD using DVD Decrypter or DVDFAb Decrypter. In my case I used DVDFab Decrypter. 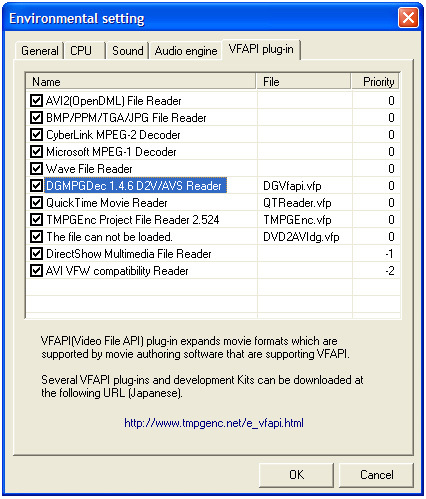 Now we need to load the VOB files of the main movie into DGIndex which is also known as DGMPGDec. Now we want to load the VOB files of the MAIN MOVIE. So click on FILE and under that click on OPEN ... the same thing can be done if you simply hit the F2 key. You want to highlight the VOB files that are the MAIN MOVIE and only those VOB files. This may take some trail and error and in some cases the movie and the extras may all be in the same VOB file "set". In that case I suggest ripping with DVD Decrypter in IFO MODE and select the MAIN MOVIE. It isn't that hard and will give you the same sort of output except you will have just the MAIN MOVIE and nothing else. Now click on OK and we are back to the main DGIndex screen. Across the top of DGIndex click on VIDEO and under that there are some options we need to change or at least double check that the default is what we want. Now across the top click on AUDIO and then under that click on OUTPUT METHOD and make sure the option DEMUX ALL TRACKS is selected. Everything else should be left at the DEFAULT selection(s). Now we want to go to the PREVIEW MODE and to do that simply hit the F5 key. To end the PREVEIW MODE simply hit the ESC (ESCAPE) key. Here we see the properties of the PAL DVD. The aspect ratio will either be 4:3 or 16:9 but remember you can have a 4:3 aspect ratio and still have a widescreen movie. Also you can have a 16:9 DVD that is 16:9 (or 1.78:1) exactly or any number of aspect ratio's such as 1.85:1 or 2.35:1 etc. so in this case 4:3 means it is NOT anamorphic 16x9 WS whereas 16:9 means it is anamorphic 16x9 WS. In other words either it is or is not enhanced for a 16x9 WS TV. The one thing you definately want to note is if the original is 4:3 or 16:9 ... the other settings don't mean much really. 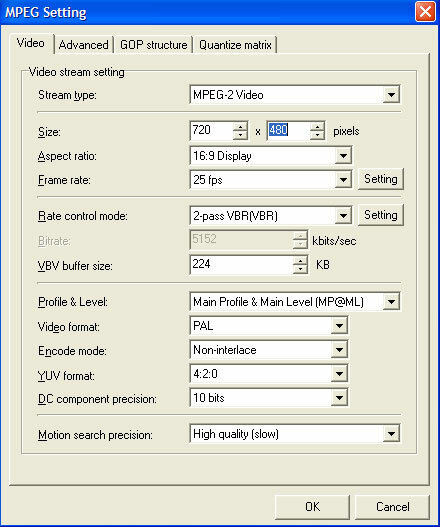 For instance a PAL DVD will always be 25fps and the resolution should always be 720x576. Also I have noticed that for some reason I do not understand ... DGIndex will almost always say that a PAL DVD source is INTERLACED but there are many times when it is actually PROGRESSIVE and yet we will get DGIndex telling us it is INTERLACED so that is one bit of info given here that cannot be relied upon. Other than the aspect ratio the 2nd important thing here are the audio tracks. In this example the first audio track is the standard 2 Channel Stereo Dolby Surround Sound track. The second track is the 5.1 Dolby Digital Surround Sound track. The third is the 5.1 DTS track and finally the fourth track is the AUDIO COMMENTARY track. The order should be the same as it is on the DVD when you cycle through the tracks using PowerDVD or WinDVD etc. Now we want to go ahead and save our project file and demux the audio. To do that click on FILE across the top and under that click on the option that says, "SAVE PROJECT" ... you can do the same thing if you hit the F4 key. Now we will be asked for a location to save the PROJECT FILE or D2V file. I like to make a DIR or FOLDER just for these files so as not to MIX them with the DVD files. So in my example I am making a DIR or FOLDER on the C: drive called P4 and that is where I will save the D2V file. You will notice that I changed the D2V file name to "movie" as that is a "habit" of mine. Anyways as you can see we have the "movie.d2v" file along with the 4 audio files. Please note that your ICONS may look different than mine so don't worry about it if they do. Now is a good time to decide what audio tracks you want to include. In my case I am going to keep the 2nd audio file (the 5.1 Dolby Digital Surround Sound track) and the 4th audio file (the 2.0 Dolby Digital audio commentary track). Make a mental note (better write it down) how much space your audio file(s) take up. In my example the 2nd and 4th audio tracks together add up to about 394MB. Now we want to start TMPGEnc Plus 2.5x (which will be referred to as simply TMPGEnc from here on out). The easiest way to set this up is to use the WIZARD MODE and select one of the PAL DVD TEMPLATES. If the original was 4:3 then we pick the "normal" PAL DVD TEMPLATE but if the original was 16:9 then we pick the PAL [16:9] DVD TEMPLATE. Now if the original PAL DVD was 4:3 but is LETTERBOXED then we can convert it to a 16x9 WS DVD so in that case you want to pick the PAL [16:9] DVD TEMPLATE. In my example I will pick the PAL [16:9] DVD TEMPLATE since the original is 16:9 and it makes no difference if you select PCM or MP2 audio (I pick PCM usually since you have to select one or the other). As in the picture above we want to open our D2V file. The bottom part (Expert Settings for Source) are automatically filled in by the WIZARD. Don't worry about them yet. Just click on NEXT when done loading the D2V file. We do NOT load any audio files here! See the SLIDER at the bottom? It is already part way across in this example (it starts at the far left or frame 1 of the movie). What you want to do is move it slowly (you can use the LEFT and RIGHT arrow keys on the keyboard for moving one frame at a time for smooth movement) and look for any interlacing artifacts. Now in my example PHANTASM 4 - OBLIVION is a PROGRESSIVE movie as I get no INTERLACING ARTIFACTS. This is good and will give the best kind of conversion. If you do see INTERLACING ARTIFACTS then you will want to use one of the DEINTERLACING options. Notice that in the screen above the option is set to NONE. If you click on the DOWN ARROW next to that you get all the different DEINTERLACING options. You will have to play around with these to find the one that looks best to you. Pick one then use the slider (the arrow keys again on the keyboard will give you smooth frame by frame motion ... don't use the mouse). If you do need to DEINTERLACE your best bet is to use one of the "ADAPTATION" modes. Now I have to admit that using just TMPGEnc for this (deinterlacing) is not the best option. If you have a PAL DVD source that needs DEINTERLACING then you are better off using AviSynth AVS scripting. I do have some posts on this topic and I will link to them at the end of this guide. However this will work (using the deinterlacing feature built-in to TMPGEnc) if you are totally against trying to learn AviSynth. If no DEINTERLACING is needed (as is the case in my example) simply click CANCEL and it will take you back to the ADVANCED TAB. If you have to deinterlace then be sure to click OK and again you will be taken back to the ADVANCED TAB but you will notice a checkmark is next to the DEINTERLACING option and the method you picked is there next to it. You will see that I found a scene in the movie that is "very bright". I did this because I want to mask the black around the edges with "fresh clean black". So you want to find a scene that is very bright like this. As you can see I "over did it" a bit but I like to make sure that the old black is completely removed so if you have to cut a couple of pixels or so into the image it ain't no big thing. I would make sure to only use even numbers though to be safe which is another reason you sometimes have to cut a pixel or so into the image. OK now click OK and you are back at the ADVANCED TAB window and you may or may not have a checkmark for DEINTERLACE and you should have a check mark on CLIP FRAME. Here I have moved the slider all the way to the left (the very end of the move) and at the top we get the total running time of the movie. In my example it is 1:26:14 which is 1 hour, 26 minutes and 14 seconds. I like to round up myself so I will write down 1 hour and 27 minutes. Now get out of this screen by selecting CANCEL. 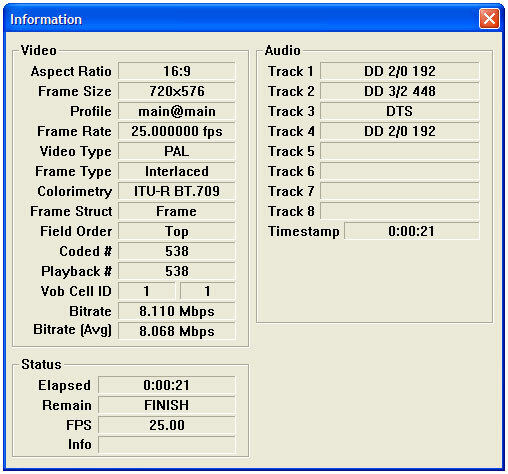 Once you get it set up like this we have to set the bitrate. In order to do that correctly though we need to figure out what bitrate to use ... the TMPGEnc WIZARD cannot be used since we are not using it for AUDIO but only for VIDEO. Notice what I did here. I filled in the running time at 1 hour and 27 minutes. I changed the audio tracks to "0" because we know what are audio track(s) will add up to and in my example I'm using two for a total of 394MB. Now you want to leave some room or overhead for your DVD authoring stage. I normally add about 200MB for this but it depends on how "complicated" a menu you will be creating. You could add anywhere from 100MB (for a very simple menu) to about 300MB for a very complicated menu. I find that 200MB works well for me. So I add 200MB overhead + 394MB for my audio and I get 594MB which I put in the "ISO" option. This now gives us the bitrate we need to use which in my example is 6096 and normally I like to round down but remember I did round up the running time by 43 seconds and 6096 is SO close to 6100 that I will use 6100 for my bitrate. 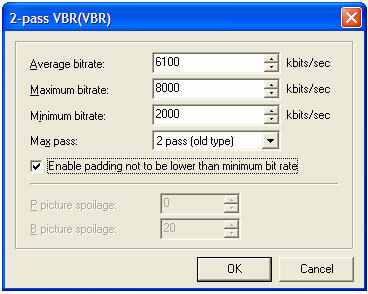 Here I have set the AVERAGE bitrate to 6100kbps as we had figured out using the bitrate calculator. I've set the MAX to 8000kbps which is normally what you want to use and I have set the MIN to 2000kbps which is a good "ballpark" number to use although some people will set this to a lower value but I don't like setting it under 2000kbps myself. Anyways click OK to make your settings "stick" and we are back to the VIDEO TAB. Now click OK and you are back to Screen 3/5 of the WIZARD MODE. Click NEXT on this screen to get to screen 4/5 of the WIZARD MODE. 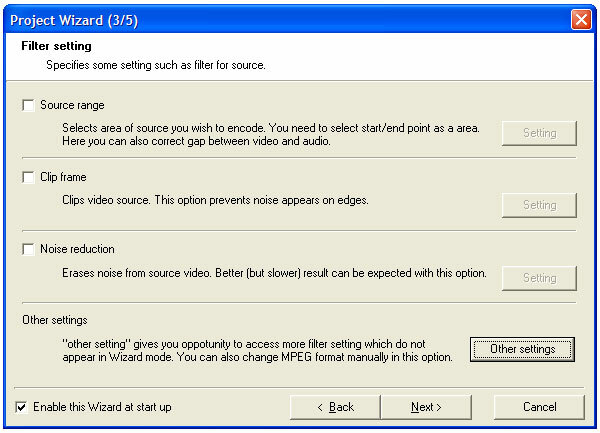 Now screen 4/5 of the WIZARD MODE will probably tell you that the end result will be "too big" to fit on a DVD but we cannot rely on this because TMPGEnc does not know what kind of audio we will be using ... it thinks we will be using PCM audio. So just ignore this screen and click NEXT to go to screen 5/5 of the WIZARD MODE. You may get a message or two about it being too big and blah blah blah ... just select continue to ignore all that. Now we are at screen 5/5 of the WIZARD MODE where we get to select where the encoded file will go. No real need to change it ... it will put it in the same DIR/FOLDER as the D2V file. The important thing here is to deselect the option, "START ENCODING IMMEDIATELY" and click OK.
Notice that unlike before we can now change ALL of the options. But be carefull as we only need to change a single option and nothing else. Now just click on OK and we are back at the MAIN SCREEN of TMPGEnc. Now we are ready to go ... just click on START in the upper left hand corner and the encoding will begin. When all is done you will have a video file in the same DIR/FOLDER as the D2V file. In my example the file will be called, "movie.m2v"
There is now one single step left before we can move to the DVD authoring stage. We have a video file that is a hybrid. The frame size is NTSC compliant (720x480) but the frames per second is PAL compliant (25fps). So we need to run the M2V file through the DGPulldown program. In DGPulldown there are various options and we want to select or checkmark the option, "25 --> 29.970"
That's it ... just click CONVERT. DGPulldown will output a new file. 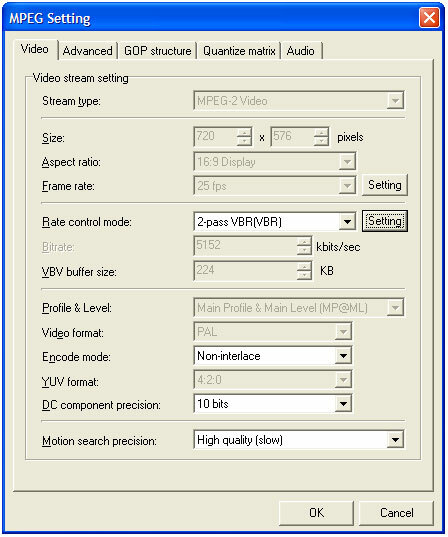 In my example the original video file was called, "movie.m2v" and the new file that DGPulldown will output will be called, "movie.m2v.pulldown.m2v". At this point you have a finished fully converted to NTSC video file (the "movie.m2v.pulldown.mwv" file) and your audio file(s). You are now ready to throw it all together into your DVD authoring software. 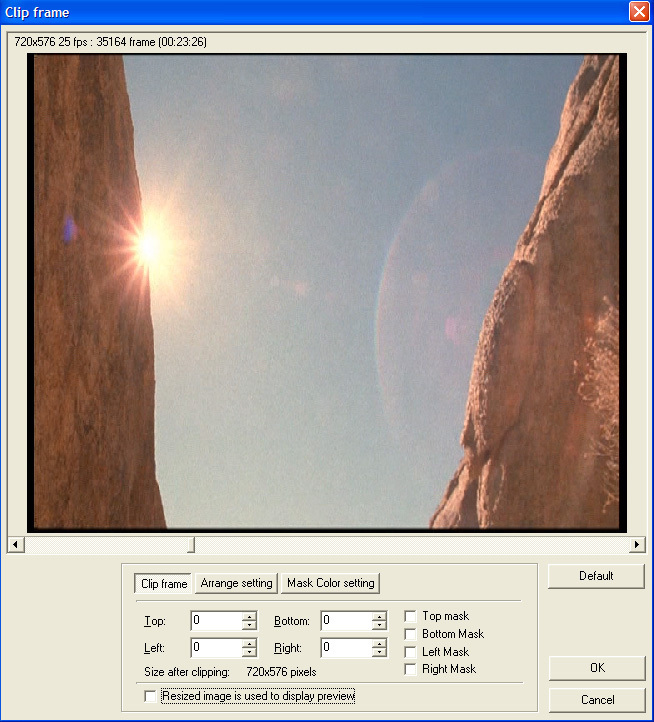 To convert a 4:3 Letterboxed PAL DVD to a 16:9 NTSC DVD you would use the 16:9 PAL DVD template (as I did in this example) but in the CLIP FRAME area you would CUT (not mask) 72 from the top and 72 from the bottom. This will properly convert it to a 16x9 WS NTSC DVD but it gives you little control ... for instance with a very wide movie (like 2.35:1) some of the "old black" stays in the image and it might not match the "new black" that a DVD player adds when watching it on a 4:3 TV. So I really suggest AviSynth for this type of conversion. 1.) THE HOLY GRAIL? ... A new method of PAL to NTSC conversion! These threads are my original thoughts on doing a PAL DVD to NTSC DVD conversion using DGPulldown. Both use AviSynth and include remarks on using either TMPGEnc Plus 2.5x as well as Cinema Craft Encoder. The first thread also covers subtitles but the second thread is a bit more up-to-date and a bit more detailed although I don't think I touched upon subtitles in the second thread. I think they are both good threads on the topic and if you want to use AviSynth they are "required" reading but they are not as "user friendly" as this guide. Feel free to post comments. I will try to update this guide if I or anyone else finds any errors or any area that needs more detail. Thank you very much for this great guide. The most attracting part to me is the way you explain the "why" of settings in each step. This helps me to understand what I'm doing, not just to remember and repeat. They that give up essential liberty to obtain a little temporary safety deserve neither liberty or safety. (Benjamin Franklin). Thank you FulciLives so much for sharing this excellent tutorial here !!! It really helped me A LOT to make my first PAL to NTSC DVD!!! It would also be great if you continue your tutorial with the DVD authoring part using TMPEGenc DVD author. What do you think? I must admit I have no desire to write a DVD Authoring guide ... when you are done using this guide you will have a compliant NTSC DVD video file that matches up with the audio from the original PAL DVD source meaning it will be NTSC DVD compliant as well (it's just audio). So after this guide you have "nothing special" but instead just regular NTSC video and audio that is DVD ready. So any DVD Authoring software will work and any guide that covers NTSC DVD Authoring will work. 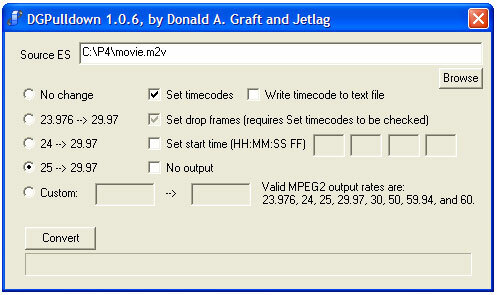 John, about that, the movie.m2v.pulldown.m2v has no audio, so in the Audio input file name of the TMPEGenc DVD Creator we have to add the original PAL audio, right? Thanks again for your help and your EXCELLENT tutorilal !!! It really took me a lot to find a decent tutorial explaining step by step how to convert PAL to NTSC, really. I'm glad I finally found it !!!!!!!!!!!!!!! You don't input the audio. The audio that you RIP off of the PAL DVD (and DEMUX with DGIndex) is the same audio that you use in the end. The only thing you need to change is the video. Yes right, the audio that we rip off (demux with DGIndex) is the one that we need in the end (authoring part). Luckily that's exactly what I did. Thank you for your step by step guide! I will put more details than necessary in order to be sure that you miss nothing...!!! The final file that I obtained after using 'DGPulldown' is jerked and not watchable. Also I want to precise that the movie on the original DVD lasts 1h42, but the final movie file (after PullDown) lasts only 43 minutes (The funnier thing is that the movie is complete, and doesn't seem to play faster but it seems to play slower!!!! Weird...) Is that normal? I was thinking that the problem was the 'Deinterlace Method' but it seems that I'm wrong... So, What can I do or change? I'm not sure what the problem might be in your case. Assuming you are doing everything correctly then I'm thinking maybe the deinterlacing method is the culprit. How do you feel about trying to use AviSynth? DECOMB will be in a ZIP file. UNZIP it to a DIR/FOLDER of your choice. Once it is UNZIPPED you just need those files "as is" ... in other words you do not "install" it. After you finish typing this in make sure to save it with an AVS ext. Let's say you decide to call it MOVIE ... you would type in MOVIE.AVS but make sure you do not accidentally make it MOVIE.AVS.TXT which is an easy mistake to do when using the windows NOTEPAD. The first line loads the DGDecode.dll file. This is needed to "read" the D2V project file. The DGDecode.dll file is in the same DIR/FOLDER as DGIndex. As you see in my example I put DGIndex in a DIR/FOLDER called DGMPGDec (the "offcial" name of DGIndex) and that DGMPGDec DIR/FOLDER is under another DIR/FOLDER called VIDEOSTUFF which is located on my C: drive. Obviously you will have to change the "path" to match your computer. The second line loads the DeComb DLL file. In the DeComb DIR/FOLDER there are actually two DLL files. One is for a P4/ATHLON computer (which is what I used) whereas the other DLL file is for a P3 or older AMD chipset computer. So make sure you pick the correct DLL for your computer and be sure to change the "path" to match your computer. The third line loads the D2V file. Again make sure you match the "path" and "filename" of your D2V project file. The fourth line uses DeComb to deinterlace the video. As in the example I normally use FieldDeinterlace(full=false) but you may or may not (depending on the video file) get better results using FieldDeinterlace(full=true) instead. The fifth line will resize the original PAL resolution to NTSC resolution. The last line is a special bit of "code" that is required when using AviSynth with TMPGEnc Plus since TMPGEnc Plus uses the RGB colorspace. Now when using TMPGEnc Plus you load the MOVIE.AVS file instead of the D2V file. 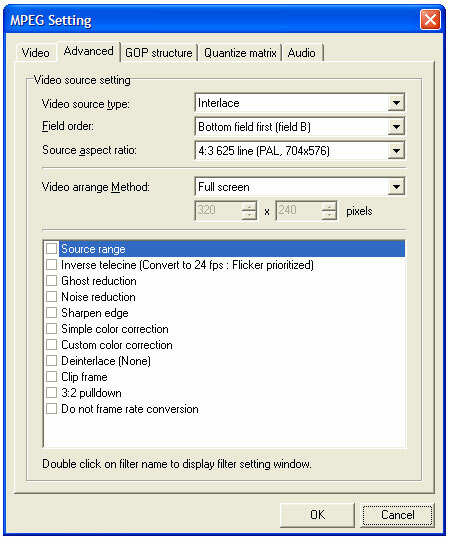 It should see the file as a PROGRESSIVE source and therefore you do NOT use the TMPGEnc Plus option for DEINTERLACING. If you must pick a field order (which I think you must do even when the source is detected as PROGRESSIVE) then pick TOP FIELD FIRST. Oh also make sure that VIDEO ARRANGE METHOD is set to FULL SCREEN and the source will probably be detected as NTSC 704x480 or something like that (which is fine). Otherwise everything else should be the same as in the guide. With this script you would proceed as if the source is already 16x9 WS and so follow the guide as normal. I am so sorry! I made a mistake! I fixed my post above to read ConvertToRGB24() which is what you want to use. I had originally typed in ConvertRGB24() which is incorrect! In this AviSynth AVS script it is the script that is doing the frame resize from 720x576 to 720x480 so TMPGEnc should see the source as NTSC (704x480) because the script is changing it to that. As long as you use FULL SCREEN for the VIDEO ARRANGE METHOD and do no clipping or masking in TMPGEnc then you will be A-OK no matter what TMPGEnc detects as the SOURCE ASPECT RATIO. If you want to do any clipping or masking then it is best to do that in the script and again just do as I said above. AddBorders(8,12,8,12) adds 8 to the left, 12 to the top, 8 to the right and 12 to the top. This cuts 8 from the left and right and 12 from the top and bottom. It then adds fresh black back so the frame size is still 720x480. What if the PAL DVD is 4:3 WS and you want to convert to NTSC 16x9 WS? Here we crop from 720x576 to 720x432 and then resize that to 720x480 which makes it NTSC 16x9 WS. What if you want to do the above (make a 4:3 PAL a 16x9 WS NTSC) but you also want to cut 8 from the left and 8 from the right to remove some ugly looking black (and replace with fresh black)? Here we crop 8 from the left and 8 from the right. We also crop 72 from the top and 72 from the bottom. This gives us 704x432. We then add 8 of fresh black to the right and to the left to make it 720x432 ... we then resize that to 720x480 to make it 16x9 WS NTSC. I did every step now I have a "VTS_01_1.m2v.pulldown.m2v" file. How do I burn my dvd with the audio. Here are the original files. There were no menues in them. And my other question is, why won't the TMPGEnc recognize the ".d2v" file if I had used DGIndex? My Icon for the .d2v file looks like that of the "unlock.mcf" used to unlock the stream type in the TMPGEnc main screen. If anyone can help I would appreciate it because it would eliminate me having to use DVD2AVI alltogeather. When you used DGIndex to get your D2V project file it should have demuxed the audio file(s) so if you look you should have one or more audio files. 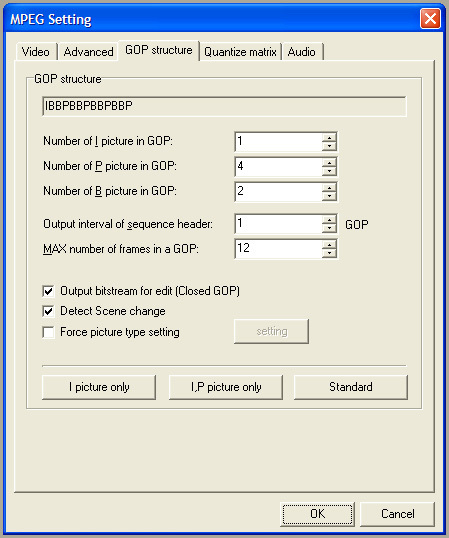 So you just import your video file VTS_01_1.m2v.pulldown.m2v and one (or more) of the audio files into any DVD Authoring program such as TMPGEnc DVD Author or DVD-Lab etc. When you run the VOB files through DGIndex and select the option that creates a D2V project file the audio gets demuxed (see my post above). See the line that is highlighted blue? Try making the PRIORITY a higher number (instead of "0" try "1"). Often this will enable TMPGEnc Plus to then read the D2V project file. Thanks for a really terrific tutorial.. I followed it to the letter and it worked perfectly.. I live in the US but I am from the UK so I have a lot of PAL content.. this has been a really useful post.. Thanks again.. 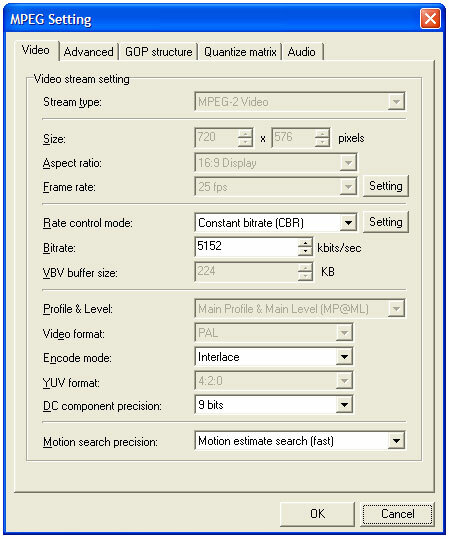 In DGI Pulldown would I use Custom and set it to go from 29.97fps - 25fps ? and obviously I would take a moment to adjust from SIZE: 720 x 480 to SIZE: 720 x 576 in TMPGEnc? and would everything else be the logical reverse of the process...? or am I over simplifying the whole thing? No. The input framerate must be less than the output framerate. So, 23.976->25fps, but not 29.97fps->25fps. If your AVI is really 29.97fps, you'll have to use another method of converting to 25fps. What manono said is true. However if you have a NTSC DVD then some will be PROGRESSIVE and you can rely on DGIndex to give you correct info about that. You would then set your TMPGEnc Plus encoding as if you are encoding a NTSC progressive source but you DO NOT want to use the built-in 3-2 pulldown feature of TMPGEnc Plus (you want to encode it as "straight" 23.976fps) and then you would of course resize from 720x480 to 720x576. 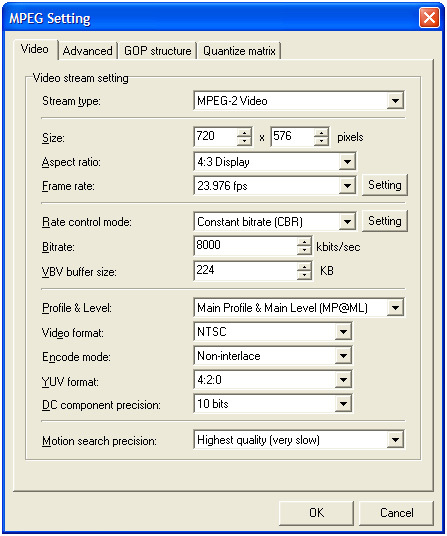 You now have a PAL compliant video file that runs the same length as the NTSC so you can use the audio as is. The image above is what TMPGEnc Plus will do when you feed it a progressive NTSC source and use the NTSC DVD WIZARD MODE. Again if you have a non progressive NTSC source then things get a bit more complicated and that is outside the scope of this guide ... sorry! If anyone needs more help on doing NTSC to PAL then please start a new thread on that topic or search for existing threads. This guide is for PAL to NTSC and I want to keep it that way. I would mount the .IMG file with Daemon Tools then you can RIP it with DVD Decrypter to IFO, BUP and VOB files. Ahh I was just about to post that I figured it out. Thats exactly what I did too. Thanks anyway, greatly appreciated! Is there a program tha is able to tell if the .IMG or .ISO file is in either the PAL or NTSC format before i is burned to a DVD? Well you can use WinRar to open the .ISO file (probably works with .IMG files as well) and extract just the VIDEO_TS.IFO then start IfoEdit and load the VIDEO_TS.IFO file. The "header" information will tell you if it is NTSC or PAL and will even tell you if it is 4:3 or 16x9 along with other info like if the audio type is PCM or AC-3 etc. Thanks for bearing with me, while I'm trying to learn all this. One quick question; I know this is a little of topic but I came across a couple of files that I've never seen before, .mds .mdf and .md0 and I'm not really sure how to proceed to get them ready to burn. The .mdf is the biggest file followed by the .md0 file. I know that these files were created by Alcohol 120% but when I burn them using that program my DVD player cant read the DVD. I also tried to mount them using Daemon but that didn't work either. Would I need to convert the files using MagicISO? So far my searches have led me to a dead end. Any advice? This is way outside the scope of this guide plus I have no real answers myself here so I think it would be best if you create your own thread on this topic in one of our forums. I am sure you will find help! Initially, I found this conversion to be rather daunting, but after I went through all of the steps, it worked like a charm... Kudos! Frank Zappa: "People wouldn't know a good movie if it smacked 'em in the face." I'm not really sure of your question. As FulciLives says, You are now ready to throw it all together into your DVD authoring software. Adding selectable subs into the mix is an authoring problem and purposely isn't covered by his guide. What do you want to know? How to extract them from the vobs? I use PGCDemux. How to author with them? I use Muxman, which supports the SUP format subtitles that PGCDemux gives you. There are a ton of other ways, though. Do they come out too high or low on the screen? I use DVDSubEdit to adjust their position. Sorry for straying off topic... After I made the conversion and burned a DVD+RW, I realized that I couldn't turn on the subtitles for some reason, so I thought there was something I missed during the conversion process. I'm rather unfamiliar with the entire subtitling process... Are they actually embedded in the VOB files? Guess I should venture over to the Subtile forum for more info. Are they actually embedded in the VOB files? Not if you do it right, they're not. They're a series of bitmaps that get overlaid on top of the video during playback. Most, but not all, authoring apps support the addition of subtitles during authoring. I realized that I couldn't turn on the subtitles for some reason, so I thought there was something I missed during the conversion process. Doesn't sound to me like they were ever added into the DVD when being authored. Subtitles have nothing to do with the encoding/conversion process, unless for some reason you decide to "burn" or "embed" them into the video. However, PAL subs also have to be converted to NTSC. I'm not too experienced in that, but I'll bet FulciLives is. Convert PAL 16x9 DVD to NTSC DVD w/ Procoder - Less Image-More Borders Why? How to convert PAL DVD to NTSC?